Permanent makup eyebrow is designed for men who wants more fullness of the brows or who suffers from Alopecia for a natural brow look. It is the best solution for eyebrows that are not quite perfect, saves time and money. Permanent makeup is the combination of the art and science of implanting pigmentation color into the dermal layer of the skin. Topical anesthetic creams, that were developed especially for permanent makeup procedures, are applied to the desired area before and during the procedure to assure the most comfortable experience possible. Our Certified Permanent Cosmetic professionals use latest technology intelligent devices, the best quality hand pieces and micro needles to apply natural synthetic pigment implant into the layer of skin known as the dermis. This technique is also used for a variety of enhancements such as eyebrows, eyeliners, lip liners, and full lips. Permanent makeup can also be used to treat skin irregularities, scars, and areolas. We use the latest technology permanent makeup device or machine that provides consistency. You get excellent results in less time with reduced skin irritation. Our machines are digitally controlled for accurate speed with 15 different micro needle combinations. They are made by one of Europe’s leading manufacturers and are praised for their safety features and smooth operation. Equipped with high precision drive, our devices offer the quietest operation in the industry. All handpieces meet international safety standards. Superior back flow protection system prevents contamination. We use highly concentrated non-allergenic, vegan friendly pigments, made in Germany. Each procedure, our technicians will guide you through all three stages of your journey to a more beautiful you: the consultation, the treatment, and the re-touch. We ensure the best results at each step along the path. 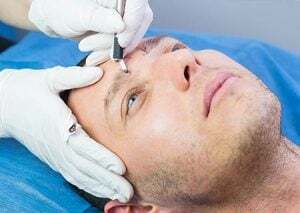 Beauty Plus Academy offer two Eyebrows Permanent Makeup procedures for men: 3D-Microblade Hairstroke Eyebrows or Ombre Eyebrows (Powered Eyebrows) to enhance their natural brow look. Both brow styles are beautiful and can be adjusted to look super soft or more intense natural look depend on your face structure, skin style, lifestyle, and various other factors as you design. Our technicians are trained and certified by accredited training centers. They have the skills and experience to perform the permanent make up procedures effectively and efficiently. You will fully participate in creating your desired look, shape and color and our technicians will suggest what technique is ultimately fit yours. The 3D-Microblade or Hairstroke Eyebrow is designed for men who wants more fullness of the brows or who suffer from Alopecia for a natural brow look. The 3D-Microblade Hairstroke eyebrow is an advanced permanent makeup technique. The artist uses either a hand tool or the highest technology machine to draw soft feather-like strokes that look like individual hairs. This technique replicates the 3D effects of natural hair follicles which cover the appearance of thinning hair, receding hair lines, hair loss, and scars. These hairstrokes are blended with existing hair for a natural look or, used to create a shapely brow from little or no hair at all. The space between the top of the eye and the brows, the fullness of the shape of the face, how large or small the eyes are, the amount of hair present, hair growth pattern, type of skin, skin tone and the color desired are all considered in applying microblade hairstrokes for eyebrows. 3D-Microblade is done manually using a hand tool, or microblade, that has extremely fine needles, slices the skin (depth is controlled by feel and may result in bleeding) and deposits pigment into the epidermis layer of the skin. The effect lasts between 6 and 12 months. Touch-ups can be difficult because of prior trauma to the skin. Hairstroke Eyebrows are applied using a digital machine with micro-needles to puncture the skin. These specialized needles have controlled depth to implant the pigments into the dermis layer of the skin. There is rarely bleeding or trauma to skin. Because there is no trauma, touch-ups typically yield great results. Hairstroke Eyebrows last approximately 3 to 5 years depending on skin variations and sun fading issues. Not everyone is a good candidate for 3D Microblade Hairstrokes. If you have oily skin, large pores, autoimmune disease, Alopecia, Thyroid, or if you frequently sweat due to extensive work outs, or have menopause, then your hair-strokes may either blend or disappear. For these special challenges, we offer the The Ombre Eyebrows (Powered Eyebrows) style. Our technicians are trained and certified by accredited training centers. They have the skills and experience to perform these permanent make up procedures effectively and efficiently. We use the latest technology permanent makeup devices or machines that to provide consistency. You get excellent results in less time with reduced skin irritation. Our machines are digitally controlled for accurate speed with 15 different micro-needle combinations. They are made by one of Europe’s leading manufacturers and are known for their safety features and smooth operation. Equipped with high precision drives, our devices offer the quietest operation in the industry. All handpieces meet international safety standards. A superior back flow protection system prevents contamination. We use highly concentrated non-allergenic, vegan friendly pigments, made in Germany. Eyebrows are the most important part of a person’s facial appearance. The ultimate perfect brows will bring you higher self-esteem and more confidence; necessary ingredients for success in your career and in your personal life. A well-shaped, well-placed brow can make the face look thinner, more polished and can make eyes look wider. Some women and men suffer from a condition called alopecia which can cause loss of all body hair, including the hair from eyebrows, that may never regrow. Loss of eyebrow hair or imperfect brows can result in feelings of unattractiveness and diminished happiness in one’s life. Permanent makeup Ombre Eyebrows, known as Powder Eyebrows, or the Shaded Eyebrow technique, refines the definition of the face and restores eyebrows by giving the right color and shape, helping to camouflage the less-desirable condition. With Ombre Eyebrows, the tails of the brow are darker, and fade into a lighter bulb (front) to the brow to create a soft, misty, powder filled, subtle look. Over time, pigment fades leaving the skin and your natural brows behind - lighter at the bulb and going darker towards the tail. If the brow is thinner, our artists can add hairstrokes for additional texture. Our technicians perform the application using the latest technology machines, micro- needles, and quality pigments to ensure the Ombre Eyebrows (Powered Eyebrows) last between 3 and 5 years. There are no contraindications in this Ombre Eyebrows technique, they heal quickly for almost everyone. 3D-Microblade Hairstroke Eyebrows, and Ombre Eyebrows (Powered Eyebrows) techniques can be combined to achieve a balanced and natural look.